Kevin Kwan is undoubtedly a traitor to his class. His class is the absurdly wealthy “Straits Chinese,” who dominate Singapore, London, Hong Kong, and wherever else there is anything worth eating or buying. Kwan has written an Evelyn Waugh-quality sendup of Straits Chinese culture, the excesses of which make Beverly Hills or Dallas’s Highland Park look like the headquarters of Mother Teresa. Crazy Rich Asians is scathingly funny, outrageous at all times, and utterly credible. Kwan could not have done the research for this book on Wikipedia. He had to live it, so that he could take us inside the lives of these ultra-wealthy individuals and families, and make us laugh our heads off in the process. The novel ostensibly tells the story of a couple, Rachel and Nick, academics who meet in New York. Both are Chinese, but Rachel has no idea just how wealthy Nick really is. In Manhattan he lives modestly. In Singapore, his family has a net worth approaching that of Bahrain. Because Nick is the heir to such colossal fortune, the long knives are out when he brings Rachel to visit, with a likelihood of marrying her. Rachel becomes the inadvertent object of gossip, ridicule, and outright terror—on a girls’ jaunt to a private hotel on a private island, she comes back to her isolated cabin to find dead fish smeared everywhere as a warning that she is not welcome. The families Kwan portrays have all the dysfunction money can buy. They’re all crazy—that’s the safest way to put it, combining wealth as a tool for control with an unquenchable need for keeping up appearances. In one memorable scene, a father goes off on his small children because one of them gets his outfit dirty, therefore destroying the look of harmony and perfection the father demands of his family. All this stuff makes you very glad to be middle class. If the novel has a fault, you could describe it as an embarrassment of riches: the story’s about 100 pages too long. He relies a little too heavily on flashbacks, especially as the story tends to wind down, and once you get past the first few hundred pages of over-the-top hyper-conspicuous consumption, old money, and twisted relationships, the reader gets the point. But that’s a small cavil compared with the overall delight that Crazy Rich Asians provides. 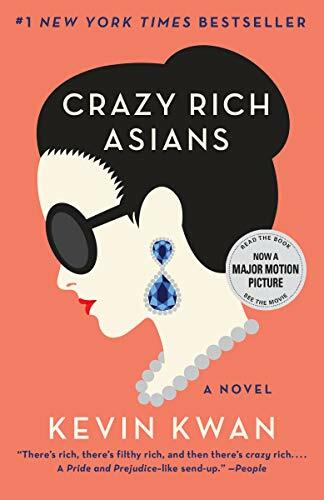 If you like to shop, eat well, wear nice clothes, or travel, Crazy Rich Asians is your life on steroids. It’s a dazzling novel, and one can’t wait to see what Kevin Kwan does next.